SMART FEATURES: A pop up plate between rollers for holding back partial packs, proportional valve for smooth speed changes, photo eyes at each section to stage product on the roller conveyor. OPERATION: The lower side feed pusher indexes product into overhead side feed area where the upper side feed pusher indexes tiers onto the tier lift table. The tier lift table lifts tiers up to the clamping station. A 4-way rotating tier clamp, with specially designed segmented clamp pads for handling irregular product, picks up product. A moving carriage plate, located beneath the clamp, supports the tier on its way to the cube lift table. The lift table is outfitted with powered discharge rollers. Before each new cube is built the pallet dispenser precisely places a pallet on the cube lift table, with the assistance of a linear transducer. CONTROLS: Reliability and smooth operation are ensured with an Allen-Bradley controller, receiving input from both encoders and linear transducers, the controller accurately operates the proportional valves. SAFETY: When the plant is operating, a standard barrier fence guard system with integrated light curtains and safety key access is provided to protect plant staff. Proper lockout/tagout procedures must be followed when servicing the equipment. When maintenance is needed, staff have access to a maintenance platform with a ladder. 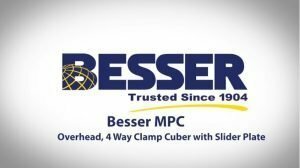 To learn how an MPC can improve your operation contact your Besser Sales Representative.